Carp Fishing in France at the beautiful E’tang De Campas. The premier venue for carp fishing in france, situated only 3.5 hours drive from Calais in Northern France; Our beautiful carp fishing lake comes to life in early spring and with the longer French summers continues into November. The Carp frequently show themselves, especially in early season where you can see big grass carp taking crust of the surface. 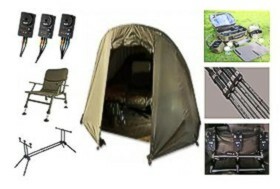 With exclusive use of the lake and facilities you can be sure of a peaceful and relaxing weeks carp fishing in France. For a full range of our facilities view our accommodation page. Be sure to check out trip tips page for bait and equipment information for carp fishing in France. If you are going carp fishing in France for the first time, you could probably do with some help to make sure everything goes as planned. The fastest way across the channel is train. This will then leave you with a 3.5 to 4 hours drive from Calais and will include toll costs of around 30 Euros. The shortest drive is via Caen which is around 1.5 hours drive, however the ferry is a 6 hour crossing from Portsmouth via Brittany ferries who are generally the most expensive. Currently we have 4 weeks remaining for this year, check out our calendar to see what dates are available and book a weeks carp fishing in france for your party today! Carp fishing in France does not only have to be for the fisherman of the house, the whole family can come along. We have Sky TV and all the facilities you have at home as well as beautiful suroundings and plenty of things to do in the local area.